Crispy on the outside, chewy on the inside, this is my go-to Gluten Free Pizza Crust Recipe. It’s freezer friendly and absolutely delicious! vegan crust | Disclosure: This post is sponsored by Bob’s Red Mill. 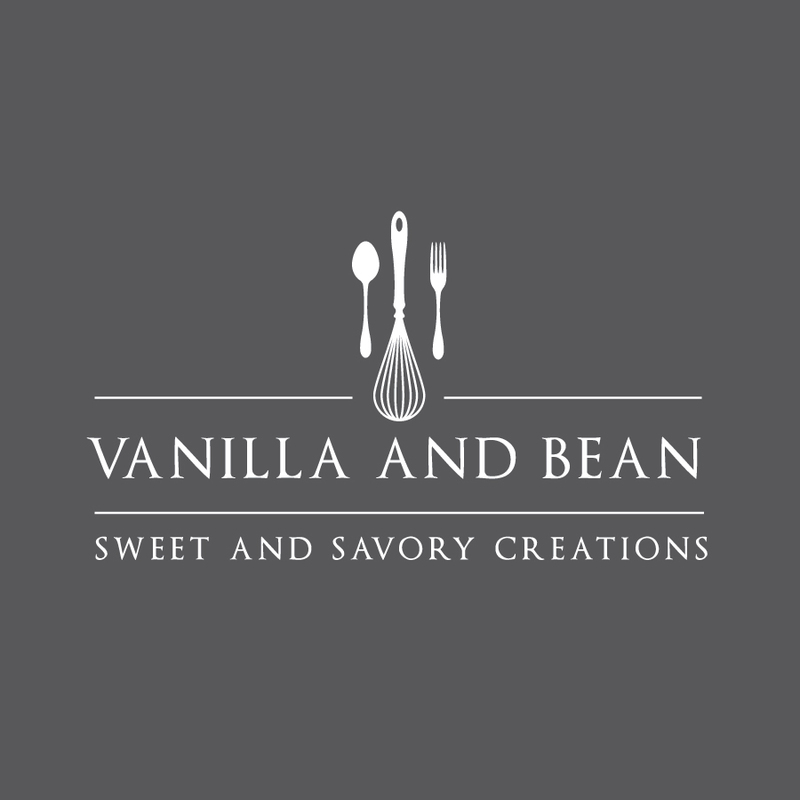 Thank you for supporting brands that help keep Vanilla And Bean cookin! All opinions are my own. When I learned I needed to give up gluten for a trial period, homemade sourdough bread was the first thing I freaked out about. Homemade pizza dough was the second. 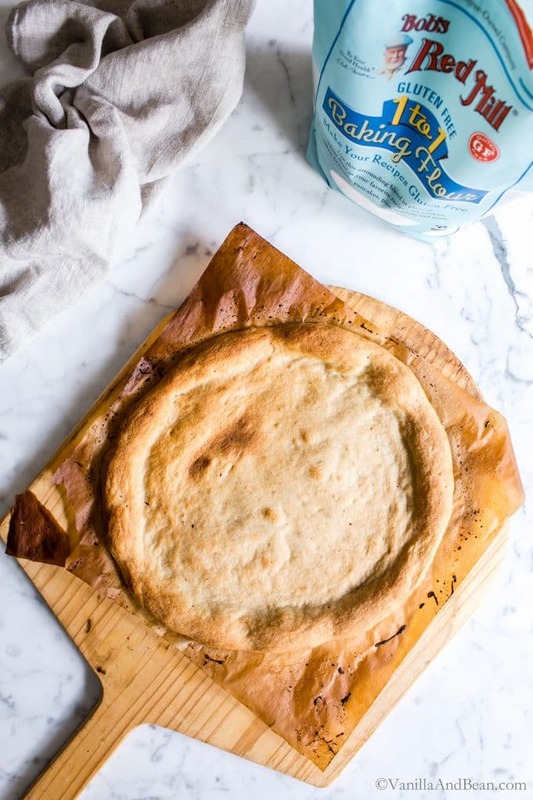 I’ve yet to fully figure out gluten free sourdough bread, but after making so many gluten free pizza dough recipes, tweaking methods and ingredients, I’m finally super excited about this gluten free pizza crust recipe! 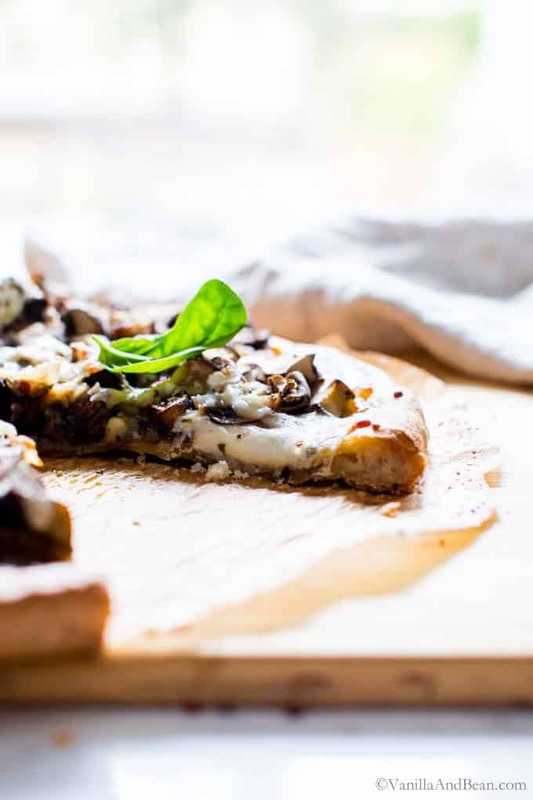 Adapted from America’s Test Kitchen, this vegan pizza crust is crispy on the outside, chewy on the inside and tastes amazing! 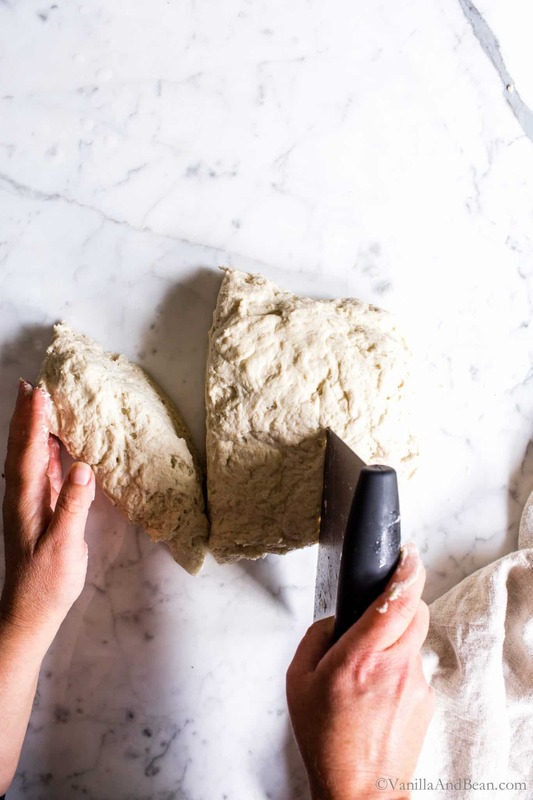 The Test Kitchen’s key ingredients include psyllium husk powder, which adds chewiness similar to a gluten crust, baking powder to give the dough a leavening boost and almond flour for structure building protein. While the ingredients for this gluten free vegan pizza dough recipe are almost identical the Test Kitchen’s, I did tweak a few. I reduced the psyllium husk powder and baking powder just a bit for a crisper crust and use Bob’s Red Mill Gluten Free 1-to-1 Baking Flour. Also, the method I use for this gluten free pizza dough recipe strays from the Test Kitchen’s machine mixing, shaping and long low temperature bake method in favor of hand mixing, different shaping method and quicker bake time somewhat similar to a homemade sourdough pizza crust I’ve been making for years. Set it and forget it for 90 minutes to let the dough rise. Par-bake the gluten free pizza crust. It’s almost ready! …now, pile on the toppings and bake the pizza for about 8 minutes. Pour your favorite beverage and enjoy a tasty gluten free pizza. 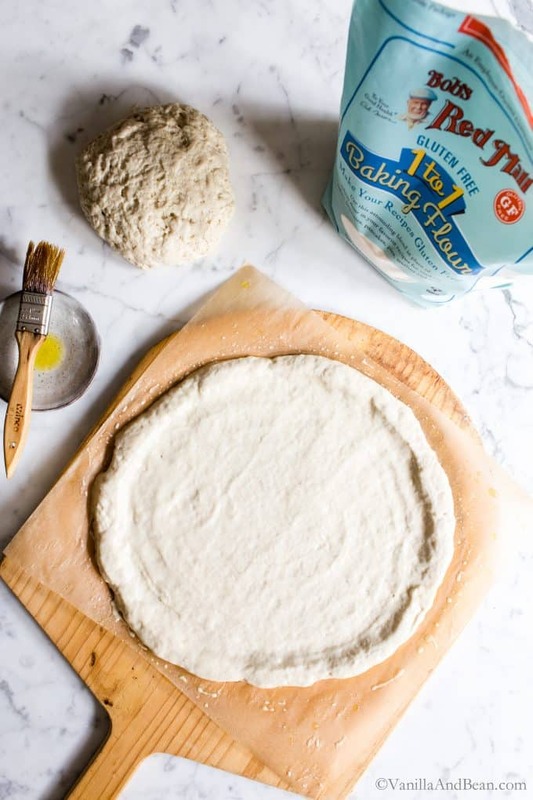 As a baker and blogger, I’ve been a long time fan of Bob’s Red Mill flours and pantry staples because choosing the best ingredients is important to me. Partnering with a brand I trust to share ingredients and recipes I love is simply icing on the cake! So when I made the transition to a gluten free diet, it was a no brainer that Bob’s Red Mill ingredients would be my first choice. It’s because of these gluten free ingredients that my transition has been easier and tastier than I imagined. 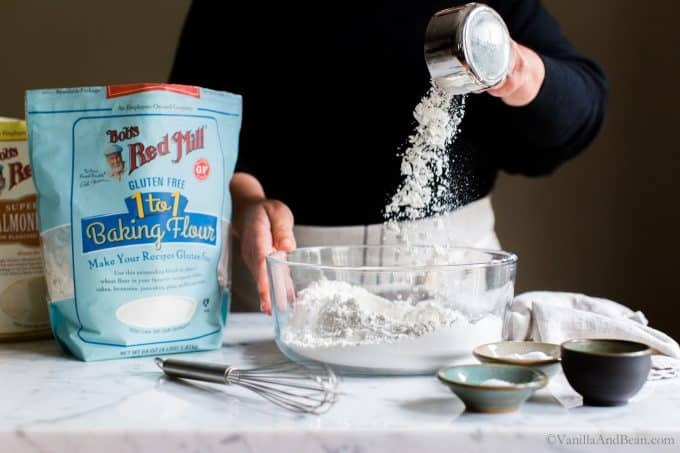 Bob’s Red Mill Gluten Free 1-to-1 Baking Flour is a blend of gluten free flours, starches and xanthan gum. 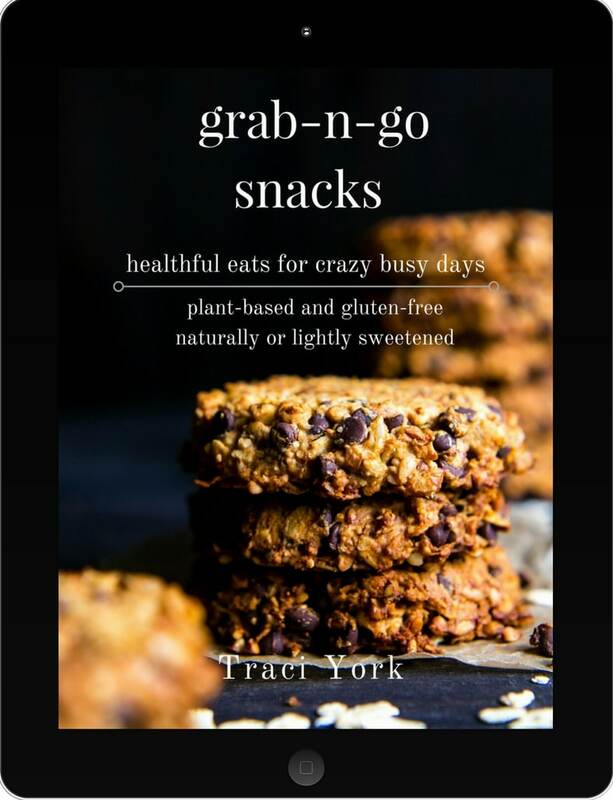 It’s helped me create light and fluffy cupcakes, pastry for apple and pumpkin pie and delectable cookies based on old favorites. 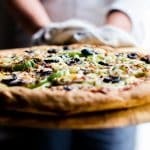 Using their Gluten Free 1-to-1 Baking Flour and Almond Flour in this vegetarian pizza dough is an easy way to still enjoy fabulous pizza sans gluten. 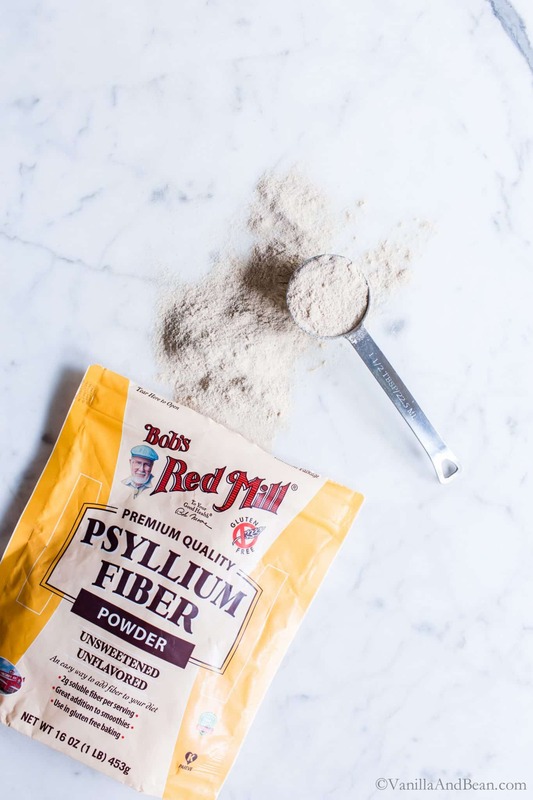 Also, Bob’s Red Mill Psyllium Husk Fiber contributes to the chewy texture in this gluten free pizza dough, like you’d want in any pizza crust. The crust in this recipe is par-baked meaning the crust is baked prior to piling on the sauce and toppings. I’ve made this recipe without par baking the crust, but the crust didn’t finish baking by the time the toppings were done. So, after the crust is par baked, add the sauce and toppings. Shaping the dough takes a little practice and finessing. 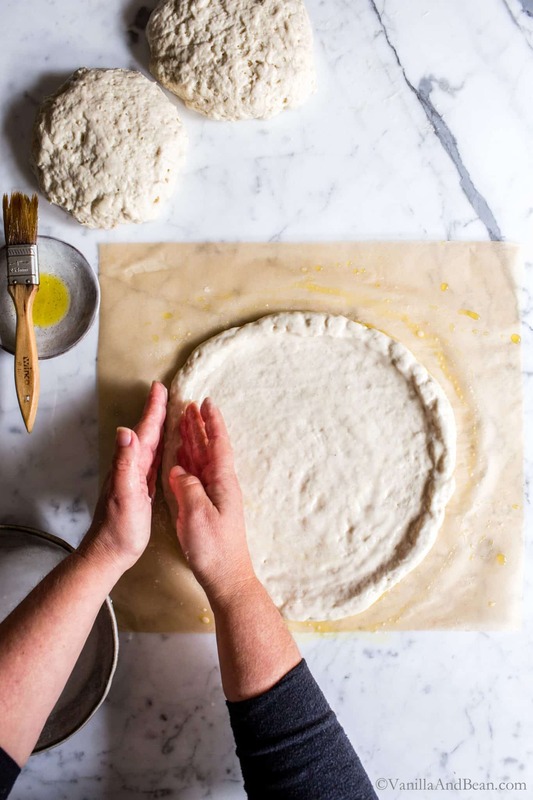 Because the dough is wet, and you wet your hands in order to shape it (sans flour), it’s almost like trying to shape mashed potatoes into a pizza shape. The excess water will cook off, don’t worry. Par-baking the crust and finished pizza at 550F contributes to a crisp outer crust and chewy interior. At that temperature, the assembled pizza will bake fast. So be sure to keep an eye on it. Seven to nine minutes should do it! To bake multiple crust and pizza, I use both a pizza stone and the back of a sheet pan. Preheating both while preheating the oven will help create a crispy crust. Either can be used because they both produce similar results with gluten free pizza dough. A pizza peel makes transferring the shaped pizza dough (with parchment supporting it) to the preheated stone/pan a snap. However, if not using a peel, the shaped gluten free pizza dough can be slid off the back of another pan and onto the preheated stone/pan. Just be careful as the oven is very hot! Vegan friendly? Yes please! This gluten free pizza crust is vegan friendly! For more recipes using Bob’s Red Mill Gluten Free 1-to-1 Baking Flour and so many other fabulous ingredients head to their website. Also, for daily inspiration check out Bob’s Red Mill on Pinterest, Facebook, Instagram and Twitter! Looking for a fabulous gluten free pizza? Give my easy Homemade Pizza Sauce and Greek Pizza a try! Crispy on the outside, chewy on the inside, this is my go-to Gluten Free Pizza Crust. It's freezer friendly and absolutely delicious! vegan crust | This recipe yields three, 10"-11" pizza crusts with 8 slices for each pizza. Final size of pizza will depend on how thin or thick you shape the crust. **Please read the recipe notes above and below for more information about this recipe! 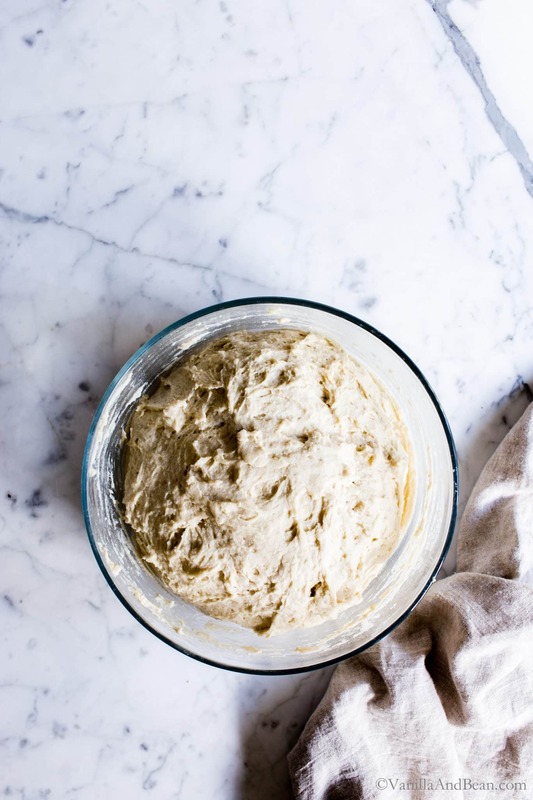 Mix the Dough: In a medium mixing bowl add the gluten free flour, almond flour, psyllium husk powder, baking powder, salt and yeast. Whisk so that the ingredients are evenly distributed. Pour in the warmed water and olive oil. Mix with a fork until the ingredients come together. Knead by hand, in the bowl, for one minutes making sure the dough is hydrated. It will be thick and sticky, almost like mashed potatoes. 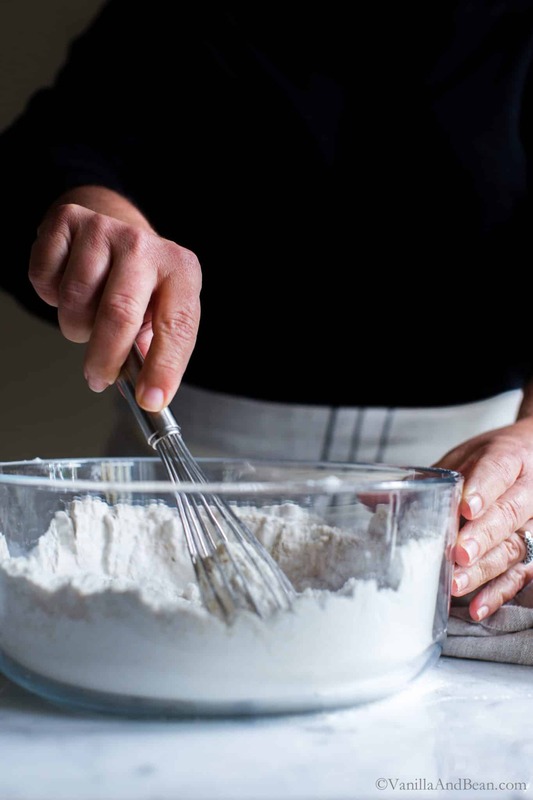 Scrape the excess dough off your fingers using a fork. Cover the bowl with a damp tea towel and leave on kitchen counter or warm area to rise for about 90 minutes. The dough should rise to about 1 1/2 times its size and be fluffy. 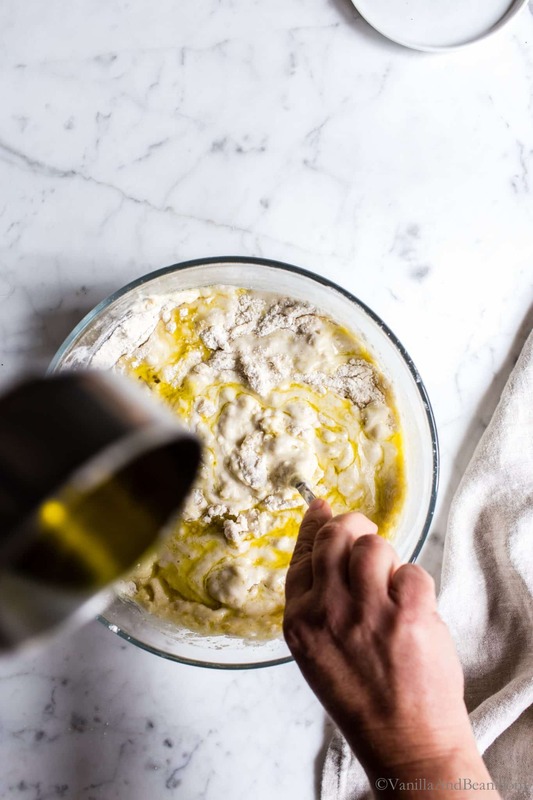 While the Dough is Rising: Prepare a sheet of parchment paper by generously brushing olive oil on the parchment. This is the base to shape and bake the crust on. Have a pizza peel or sheet pan standing by to slide the shaped dough on to for baking. Prepare the oven by placing oven rack at the very top setting and if making two pizzas, another rack directly below the top. Place sheet pan(s) and/or pizza stones on racks. Two crusts or pizzas can be baked at the same time. Prepare the ingredients for the pizza. Just before you're ready to divide and shape the dough, preheat the oven to 550F (288C). Divide the Dough: At this point you'll only use water to help shape the dough. Fill a shallow dish with water so you can wet your hands as you work with the dough. Do not use flour here (as traditionally done with glutenous dough). Moisten a work surface with water. Turn the dough out onto the moist work surface. Dip your finger tips and palms into the water and pat the dough into somewhat of a rectangle, then divide the dough into three equal pieces. Moisten your hands again and shape each piece into a rough ball by tucking the edges under. Set the dough balls on parchment or a water-moist work surface. At this point the dough can be frozen (see notes below). Shape the Dough: On the oiled parchment paper, set a pizza dough ball in the center. Dip your palm and fingertips into the water. 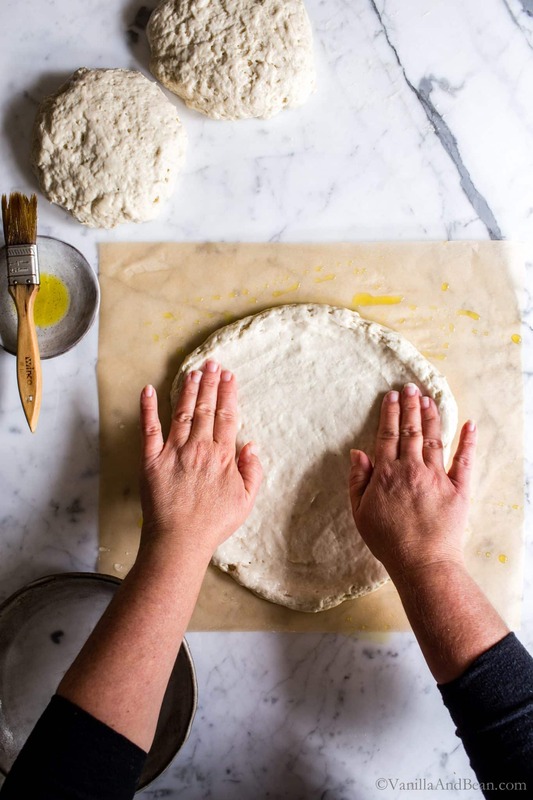 Working with both finger tips and palms, start pressing in the center of the dough, working your way towards the edges in a circular pattern leaving an edge all around that is thicker than the base of the crust (you can play with this if you like a thicker crust). It will feel almost like trying to shape mashed potatoes! There may be a bit of occasional tearing, if so, wet your hands/fingertips and smooth those areas back together. Turn the parchment as you work the dough so that a pizza shape can be achieved. Continue, wetting your hands and smoothing over the dough with light pressure as needed so the dough does not stick to your hands and you shape it by smoothing the dough in circular motions and/or pinching to create the edges, then smoothing with moist fingers again. It's okay that the parchment gets a little wet. I make my crust thin on the bottom and go for an 11" crust - but you can play with this if you like a little thicker crust (10" pizza). Wet a fork and dock the pizza with the tines of the fork 5-6 times. Par-Bake the Dough: Slide the shaped pizza dough onto a pizza peel or the back of a sheet pan using the parchment as a handle. Open the oven and pull out the rack with the stone/pan. Slide the pizza dough onto the preheated pizza stone or back of the preheated pan. Sometimes the center puffs a bit during baking. Check the dough half way through baking and if it has puffed in the center, use a knife to poke a small hole to let some of the steam out from under the pizza - use the knife to press it down to release the steam. Par-bake for 13-15 minutes or until the dough is golden brown. Remove from oven and top with favorite sauce and toppings. (The parchment will be brittle at this point, and can be removed before baking the pizza if desired). 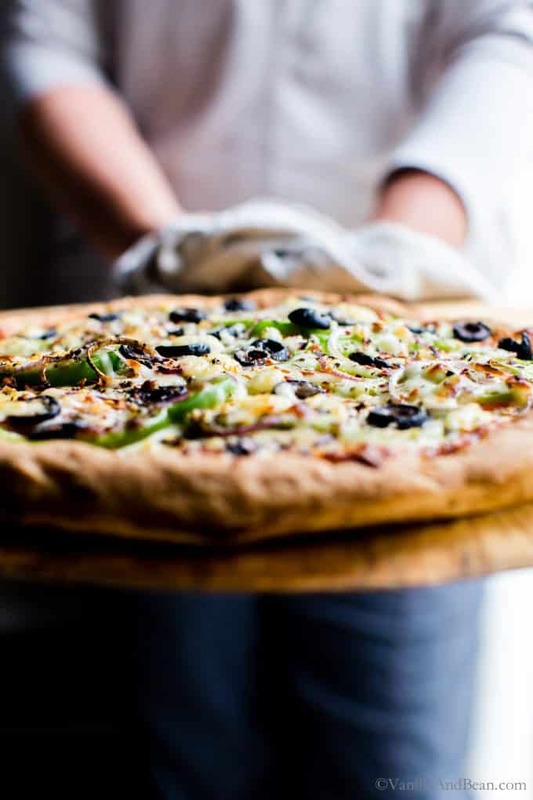 Bake the Pizza: Bake the assembled pizza on preheated stone or pan at 550F (288C) for 7-9 minutes or until the cheese has melted and sauce is bubbly - a little cheese blistering is okay! The pizza bakes fast at high heat, so keep an eye on it! Remove from oven and allow to rest for five minutes. Cut into 8 equal pieces. Store pizza leftovers in a lidded container in the refrigerator for up to three days. Reheat at 350F for about 12 minutes. 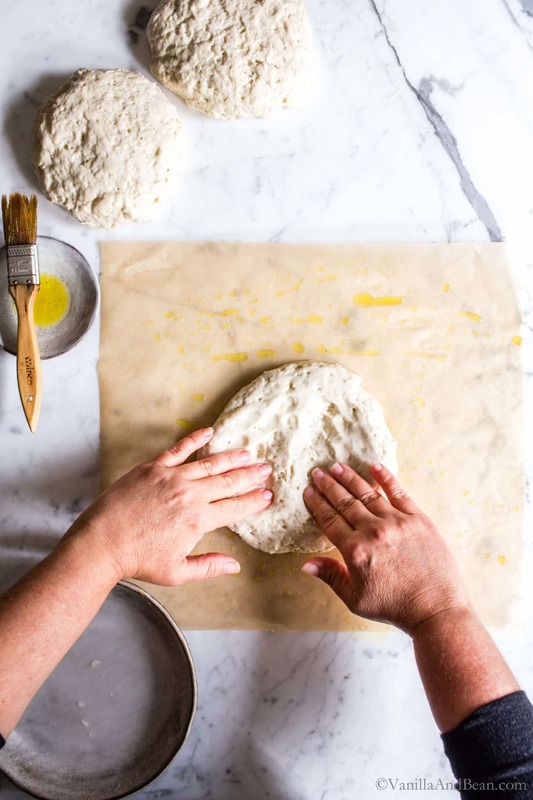 Pizza Dough Making Supplies: Parchment paper, bench scraper or dough divider, pastry brush, pizza peel (recommended), pizza stone, sheet pan (one or more depending on how many pizzas you're cooking and if using a pizza stone). How to Freeze the Pizza Dough: Brush olive oil on the inside of a freezer bag or container. Gently place the dough into the bag and freeze for up to two months. Thaw in the refrigerator overnight to be shaped and par baked the next day. In baking, weighing ingredients is important for optimal outcome. I find that especially true in gluten free baking. If you feel you'll be baking regularly, I recommend investing in a good digital kitchen scale. I use one like this and have been using it for about five years. Adapted from America's Test Kitchen The How Can It Be Gluten Free Cookbook. This looks delicious- cannot wait to try! Could you substitute psyllium with flaxseed meal or an egg? Hi Taylor! Thank you for your note! I’ve not tried either of these two alternatives. The purpose of the psyllium husk is to mimic the elasticity and binding power of gluten, of which it does a fabulous job. It truly makes this gluten free crust special. An egg helps in binding, but does not produce the ‘chewy’ or elasticity that psyllium does. Same with flaxseed meal. I’ve not tried either in this recipe, but you could certainly give it a go! Please let us know if you give it a try! I hope this helps. I’m fairly new to eating gluten-free, and after trying a couple of disappointing gf offerings from local pizzerias, I decided to make my own. Yours was the recipe that stood out to me as being the most familiar in terms of method – I’m a former bread baker – and after trying it, all I can say is thank you! It was amazing! My husband, who isn’t gluten free, couldn’t tell the difference. This new way of eating is going to be easier than I thought! Hi Patricia! Thank you so much for coming back and leaving a note and rating… I’m so happy to hear you’re enjoying the pizza! You know, my mom has been visiting and she’s not gluten free either.. but said she looooves this crust! My hubs too. 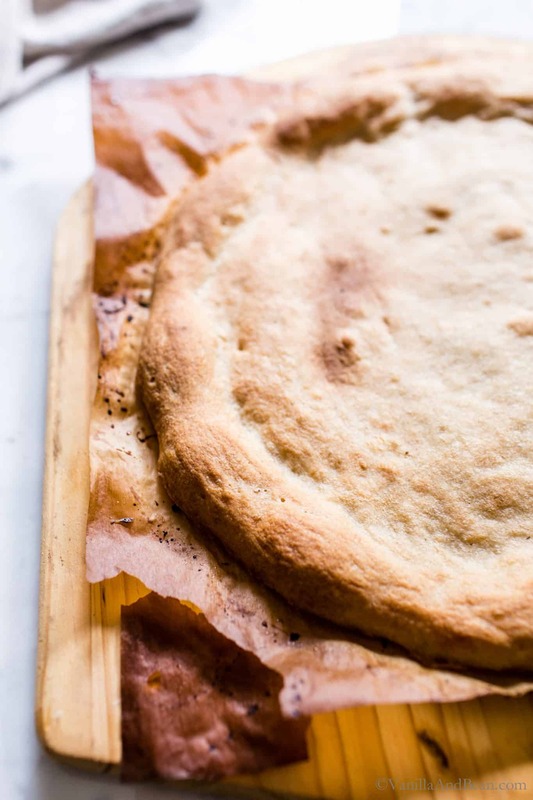 Isn’t it great that the method just works like a good ole’ regular crust (yeasted and sourdough) – this is the same baking method I use there too! Thank you again Patricia! I wish you well on your gf journey! Is there anything to replace almond flour? My grandson is allergic to nuts. Hi Nai nai! For this recipe to work, the high protein of almond flour is essential. If your grandson can have seeds, you could give sunflower seed meal a go, although I’ve not tried it. I hope this helps! Hi, if I make this into smaller pizzas for kids how long should the par bake be? Hi Tracy! I’ve not tried it, but I’ve seen a few snaps from the community on IG who did! Par baking smaller pizzas should be close to the same as a full size pizza. Just keep an eye on the minis. I’d take a peek around 10 minutes to see. They need to be just golden. Please let us know how it turns out for you! I hope this helps and y’all enjoy the pizzas! This recipe looks amazing! I was just wondering if I could make and par bake the day before I’m actually making the pizzas? Hi Kimberley! Thank you for your note and kind words! I have done this a few hours before baking pizzas and it worked, but they didn’t taste as ‘fresh’ (texture wise) as if you’d bake them just before. If you give it a go, wrap the par baked pizzas tightly in a plastic bag or kitchen wrap (I wish there was an alternative to plastic, but in this case, tea towels wont work). This will keep them freshest until ready to use. I hope you enjoy the recipe! Thank you for the suggestion! I’m going to go ahead and do it right before so they are the freshest. Can’t wait! I was sure I’d done something wrong, because when I added the warm water to the dry ingredients, the consistency was more like ‘batter’ than the dough I anticipated. Thank goodness for your mashed potato mention, which pushed me forward. It took considerably longer for the ‘dough’ to rise at my house (6 hours). After rising, I’d describe the dough as a sticky and heavy whipped cream. This recipe and crust is AMAZING! If you are GF try it, it’s not difficult at all. I wanted to follow up too, on the six hour rise… I’ve made this so many times and have never experienced it taking that long before. It’s been reliable right at 90 minutes every time. Did you warm the water to 100F? Oh my!!! This looks like the best pizza in the world!! Yummy. I’ve been craving a pizza night and this crust looks simply perfect! Once a week Laura, is a must! Wow, that is one stunning gluten-free pizza! I’ve never seen one look so fluffy and golden. Now you’ve got me craving pizza for breakfast, lol! You know I LOVE Bob’s products too Traci! The best of the best! I have tried Bob’s Gluten Free flour. I have a good friend who needs to eat gluten free, so I will definitely be treating her to pizza for our next get together! I’m with you Mary Ann! So sweet to do this for your friend… I hope you two enjoy the recipe!! can you substitute psyllium with extra flour? Hi Tom! The psyllium pretty much helps binds everything together. It adds structure and texture too. It’s essential in this recipe. I hope this helps!